Biography*: Baldwin V of Hainaut (1150 – 17 December 1195) was count of Hainaut (1171–1195), margrave of Namur as Baldwin I (1189–1195) and count of Flanders as Baldwin VIII (1191–1195). He was the son of Baldwin IV, Count of Hainaut. Flanders was acquired via his marriage to his widowed third cousin once removed Margaret I of Flanders, Countess of Flanders in 1169. Namur was acquired from his mother Alice of Namur. He was described as "The Count Baldwin with eyes of blue." [S746] Wikipedia, online http://Wikipedia.com, https://en.wikipedia.org/wiki/Baldwin_IV,_Count_of_Hainaut. [S746] Wikipedia, online http://Wikipedia.com, https://en.wikipedia.org/wiki/Margaret_I,_Countess_of_Flanders. [S746] Wikipedia, online http://Wikipedia.com, https://en.wikipedia.org/wiki/Baldwin_V,_Count_of_Hainaut. Biography*: Margaret I (died 15 November 1194) was countess of Flanders suo jure from 1191 to her death. She was the daughter of Thierry, Count of Flanders, and Sibylla of Anjou, and the heiress of her childless brother, Philip of Flanders. In 1160 she married Ralph II, Count of Vermandois. He died of leprosy in 1167 without issue. Sybille (1179–9 January 1217), married c. 1197 Guichard IV, Sire de Beaujeu (d. 1216). They had a daughter, Agnes of Beaujeu. [S746] Wikipedia, online http://Wikipedia.com, https://en.wikipedia.org/wiki/Thierry,_Count_of_Flanders. Biography*: Thierry of Alsace (Dietrich) (c.?1099 – January 17, 1168), in Flanders known as Diederik van den Elzas, was count of Flanders from 1128 to 1168. He was the youngest son of Duke Thierry II of Lorraine and Gertrude of Flanders (daughter of Robert I of Flanders). With a record of four campaigns in the Levant and Africa (including participation in the Second Crusade, the failed 1157–1158 siege of the Syrian city Shaizar, and the 1164 invasion of Egypt), he had a rare and distinguished record of commitment to crusading. After the murder of his cousin Charles the Good in 1127, Thierry claimed the county of Flanders as grandson of Robert I, but William Clito became count instead with the support of King Louis VI of France. William's politics and attitude towards the autonomy of Flanders made him unpopular, and by the end of the year Bruges, Ghent, Lille, and Saint-Omer recognized Thierry as a rival count. Thierry's supporters came from the Imperial faction of Flanders, and upon his arrival he engaged in battle against William. Louis VI of France had Raymond of Martigné, the Archbishop of Reims, excommunicate Thierry. Louis VI then besieged Lille, but was forced to retire when Henry I of England, William Clito's uncle, transferred his support to Thierry. However, Thierry was defeated at Tielt and Oostkamp and fled to Brugge. He was forced to flee Brugge as well, and went to Aalst, where he was soon under siege from William, Godfrey I of Leuven, and Louis VI. The city was about to be captured when William was found dead on July 27, 1128, leaving Thierry as the only claimant to the seat. Thierry set up his government in Ghent and was recognized by all the Flemish cities as well as King Henry, who had his Flemish lords in England swear fealty to him. Thierry himself swore homage to Louis VI after 1132, in order to gain the French king's support against Baldwin IV, Count of Hainaut, who had advanced his own claim on Flanders. In 1132 his wife, Suanhilde, died, leaving only a daughter. In 1139 he went on pilgrimage to the crusader Kingdom of Jerusalem, and married Sibylla of Anjou, daughter of King Fulk of Jerusalem and the widow of William Clito; a very prestigious marriage. This was the first of Thierry's four pilgrimages to the Holy Land. While there he also led a victorious expedition against Caesarea Phillippi, and fought alongside his father-in-law in an invasion of Gilead. He soon returned to Flanders to put down a revolt in the Duchy of Lower Lotharingia, ruled at the time by Godfrey III of Leuven. Thierry went on crusade a second time in 1147 during the Second Crusade. He led the crossing of the Maeander River in Anatolia and fought at the Battla of Attalya in 1148, and after arriving in the crusader Kingdom he participated in the Council of Acre, where the ill-fated decision to attack Damascus was made. He participated in the Siege of Damascus, led by his wife's half-brother Baldwin III of Jerusalem, and with the support of Baldwin, Louis VII of France, and Conrad III of Germany, he lay claim to Damascus; the native crusader barons preferred one of their own nobles, Guy Brisebarre, lord of Beirut, but in any case the siege was a failure and all parties returned home. During his absence, Baldwin IV of Hainaut invaded Flanders and pillaged Artois; Sibylla reacted strongly and had Hainaut pillaged in response. The Archbishop of Reims intervened and a treaty was signed. When Thierry returned in 1150, he took vengeance on Baldwin IV at Bouchain, with the aid of Henry I, Count of Namur and Henry II of Leez, Bishop of Liège. In the subsequent peace negotiations, Thierry gave his daughter Marguerite in marriage to Baldwin IV's son, the future Baldwin V, Count of Hainaut. 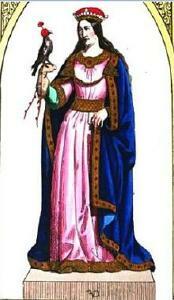 In 1156 Thierry had his eldest son married to Elizabeth of Vermandois, daughter and heiress of Raoul I of Vermandois. In 1156 he returned to the Holy Land, this time with his wife accompanying him. He participated in Baldwin III's siege of Shaizar, but the fortress remained in Muslim hands when a dispute arose between Thierry and Raynald of Châtillon over who would possess it should it be captured. He returned to Flanders 1159 without Sibylla, who remained behind to become a nun at the convent of St. Lazarus in Bethany. Their son Philip had ruled the county in their absence, and he remained co-count after Thierry's return. In 1164 Thierry returned once more to the Holy Land. He accompanied King Amalric I, another half-brother of Sibylla, to Antioch and Tripoli. He returned home in 1166, and adopted a date palm as his seal, with a crown of laurels on the reverse. He died on January 17, 1168, and was buried in the Abbey of Watten, between Saint-Omer and Gravelines. His rule had been moderate and peaceful; the highly developed administration of the county in later centuries first began during these years. There had also been great economic and agricultural development, and new commercial enterprises were established; Flanders' greatest territorial expansion occurred under Thierry. Laurette of Flanders, who married four times: Iwain, Count of Aalst; Henry II, Duke of Limburg; Raoul I of Vermandois, Count of Vermandois; Henry IV of Luxembourg. Laurette finally retired to a nunnery, where she died in 1170. Biography*: Sibylla of Anjou (c. 1112–1165) was a countess consort of Flanders. She was the daughter of Fulk V of Anjou and Ermengarde of Maine, and wife of William Clito and Thierry, Count of Flanders. She was the regent of Flanders in 1147-1149. In 1123 Sibylla married William Clito, son of the Norman Robert Curthose and future Count of Flanders. Sibylla brought the County of Maine to this marriage, which was annulled in 1124 on grounds of consanguinity. The annulment was made by Pope Honorius II upon request from Henry I of England, William's uncle; Fulk opposed it and did not consent until Honorius excommunicated him and placed an interdict over Anjou. Sibylla then accompanied her widower father to the crusader Kingdom of Jerusalem, where he married Melisende, the heiress of the kingdom, and became king himself in 1131. In 1139 she married Thierry, Count of Flanders, who had arrived on his first pilgrimage to the Holy Land. She returned to Flanders with her new husband, and during his absence on the Second Crusade the pregnant Sibylla acted as regent of the county. Baldwin IV, Count of Hainaut took the opportunity to attack Flanders, but Sibylla led a counter-attack and pillaged Hainaut. In response Baldwin ravaged Artois. The archbishop of Reims intervened and a truce was signed, but Thierry took vengeance on Baldwin when he returned in 1149. In 1157 she travelled with Thierry on his third pilgrimage, but after arriving in Jerusalem she separated from her husband and refused to return home with him. She became a nun at the Convent of Sts. Mary and Martha in Bethany, where her step-aunt, Ioveta of Bethany, was abbess. Ioveta and Sibylla supported Queen Melisende and held some influence over the church, and supported the election of Amalric of Nesle as Latin Patriarch of Jerusalem over a number of other candidates. Sibylla died in Bethany in 1165. 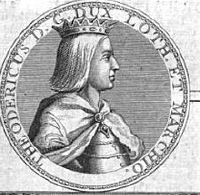 Biography*: Theodoric II (died 30 December 1115), called the Valiant, was the duke of Lorraine from 1070 to his death. He was the son and successor of Gerhard and Hedwige of Namur. 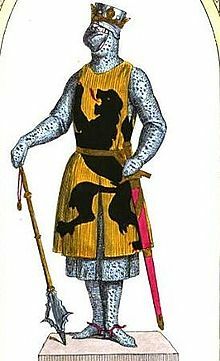 He is sometimes numbered Theodoric I if the dukes of the House of Ardennes, who ruled in Upper Lorraine from 959 to 1033, are ignored in favour of the dukes of Lower Lorraine as predecessors of the later dukes of Lorraine. In fact, Sophia, the daughter of Duke Frederick II of the House of Ardennes, who had inherited the counties of Bar and Montbéliard, had a husband named Louis, who contested the succession. In order to receive the support of his brother, Theodoric gave his brother the County of Vaudémont and convened an assembly of nobles, who elected him duke over Louis. Soon Louis was dead, but his son, Theodoric II of Bar, claimed the succession anyway. However, Emperor Henry IV confirmed Theodoric the Valiant in the duchy. 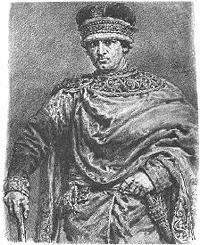 Probably for this reason, Theodoric remained faithful to the emperors throughout his rule. He fought the Saxons while they were at war with the Emperor between 1070 and 1078 and he opposed the popes Gregory VII and Urban II when they were in conflict with the Emperor. In 1095, he planned to take up the Cross (i.e., go on Crusade, specifically the First), but his ill health provoked him to drop out, nevertheless convincing his barons to go east. Thereafter, he took little part in imperial affairs, preferring not to intervene between Henry IV and his son Henry, or against Lothair of Supplinburg, duke of Saxony. Simon (1076 – 1138), his successor as Duke of Lorraine, married to Adelaide of Leuven (d. 1158), daughter of his stepmother Gertrude and Henry III, Count of Leuven. [S746] Wikipedia, online http://Wikipedia.com, https://en.wikipedia.org/wiki/Theodoric_II,_Duke_of_Lorraine. Biography*: Gertrude of Flanders, Duchess of Lorraine (c. 1070–1117), also Countess of Louvain, Landgravine of Brabant until 1095, as the consort of her husbands. At the time the duchy was the upper Lorraine, since 959 separated from the duchy of Lower Lorraine. Gertrude was daughter of Robert I, Count of Flanders (c. 1035–1093) and Gertrude of Saxony (c. 1030 – 1113). Robert was son of Baldwin V of Flanders and Adèle, a daughter of King Robert II of France, and Gertrude daughter of the Duke of Saxony. 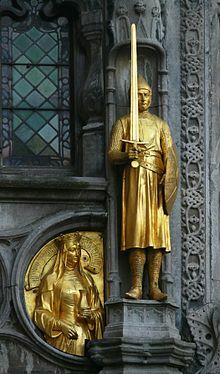 She was sister of Robert II, Count of Flanders (c. 1065 – 1111), "Robert the Crusader". Gertrude married firstly Henry III, Count of Leuven (died wounded in a tournament in Tournai in 1095), of the House of Reginar. He was count of Louvain from 1078 to 1095 and landgrave of Brabant from 1085. At Henry's death, his brother Godfrey I succeeded as count and landgrave. From 1106 he also became duke of Lower Lorraine. Adelaide (d. 1158), wife of duke Simon I of Lorraine (1076 – 1138), son of her stepfather Theodoric with Hedwige (d. c. 1090). [S746] Wikipedia, online http://Wikipedia.com, https://en.wikipedia.org/wiki/Gertrude_of_Flanders,_Duchess_of_Lorraine. [S746] Wikipedia, online http://Wikipedia.com, https://en.wikipedia.org/wiki/Alys_of_France,_Countess_of_the_Vexin. 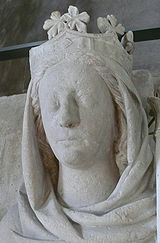 Biography*: Constance of Castile (c 1140 - 4 October 1160) was Queen of France as the second wife of Louis VII, who married her following the annulment of his marriage to Eleanor of Aquitaine. She was a daughter of Alfonso VII of León and Berengaria of Barcelona, but her year of birth is not certainly known. The official reason for her husband's divorce from Eleanor of Aquitaine had been that he was too close a relative of Eleanor for the marriage to be legal by Church standards; however, he was even more closely related to Constance. Constance died giving birth to her second child. Desperate for a son, her husband remarried a mere five weeks after her death. Constance was buried in the Basilica of Saint-Denis, France. Biography*: John FitzGilbert the Marshal of the Horses (c. 1105 – 1165) was a minor Anglo-Norman nobleman during the reign of King Stephen, and fought in the 12th century civil war on the side of Empress Matilda. Since at least 1130 and probably earlier, he had been the royal marshal to King Henry I. When Henry died, John FitzGilbert swore for Stephen and was granted the castles of Marlborough and Ludgershall, Wiltshire during this time. Along with Hamstead Marshal, this gave him control of the valley of the River Kennet in Wiltshire. Around 1139, John changed sides and swore for the Empress Matilda. In September 1141, Matilda fled the siege of Winchester and took refuge in the Marshal's castle at Ludgershall. While covering her retreat from Winchester, John Marshal was forced to take refuge at Wherwell Abbey. The attackers set fire to the building, and John lost an eye to dripping lead from the melting roof. In 1152, John had a celebrated confrontation with King Stephen, who had besieged him at Newbury Castle. After John had broken an agreement to surrender, Stephen threatened to kill his son, whom John had given as a hostage. John refused, saying he could make more sons, but Stephen apparently took pity on the young boy and did not kill him. The boy grew up to be William Marshal, 1st Earl of Pembroke, a legendary figure in medieval lore, and one of the most powerful men in England. The office of Lord Marshal, which originally related to the keeping of the King's horses, and later, the head of his household troops, was won as a hereditary title by John, and was passed to his eldest son, and later claimed by William. John also had a daughter, Margaret Marshal, who married Ralph de Somery, son of John de Somery and Hawise de Paynell. John was the son of Gilbert, Royal Serjeant and Marshal to Henry I, and his wife Margaret. After his father died in 1129 John inherited the title of the king's marshal. John married Aline Pipard whose father Walter Pipard had been a friend of John's father. John arranged an annulment of his marriage to Aline Pipard in order to marry Sibyl of Salisbury, the sister of Patrick of Salisbury, who had been a local rival of his, and a supporter of King Stephen, up to that point. John had two sons by Aline - Gilbert (d. 1166) and Walter (d. bef.1165). Walter predeceased his father and Gilbert died shortly after inheriting his father's lands. [S746] Wikipedia, online http://Wikipedia.com, https://en.wikipedia.org/wiki/…). [S746] Wikipedia, online http://Wikipedia.com, https://en.wikipedia.org/wiki/William_Marshal,_1st_Earl_of_Pembroke. Biography*: Richard de Clare, 3rd Earl of Hertford (c.?1153–1217), Anglo-Norman nobleman and Welsh baron. Richard was the son of Roger de Clare, 2nd Earl of Hertford and Maud, daughter of James de St. Hillary. More commonly known as the Earl of Clare, he had the majority of the Giffard estates from his ancestor, Rohese. He was present at the coronations of King Richard I at Westminster, 3 September 1189, and King John on 27 May 1199. He was also present at the homage of King William of Scotland as English Earl of Huntingdon at Lincoln. He married (c. 1172) Amice FitzWilliam, 4th Countess of Gloucester (c. 1160–1220), second daughter, and co-heiress, of William Fitz Robert, 2nd Earl of Gloucester, and Hawise de Beaumont. Sometime before 1198, Earl Richard and his wife Amice were ordered to separate by the Pope on grounds of consanguinity. They separated for a time because of this order but apparently reconciled their marriage with the Pope later on. He sided with the Barons against King John, even though he had previously sworn peace with the King at Northampton, and his castle of Tonbridge was taken. He played a leading part in the negotiations for Magna Carta, being one of the twenty five sureties. On 9 November 1215, he was one of the commissioners on the part of the Barons to negotiate the peace with the King. In 1215, his lands in counties Cambridge, Norfolk, Suffolk and Essex were granted to Robert de Betun. He and his son were among the Barons excommunicated by the Pope in 1215. His own arms were: Or, three chevronels gules. Gilbert de Clare (ca. 1180 – 25 October 1230), 4th Earl of Hertford and 5th Earl of Gloucester, (or 1st Earl of Gloucester of new creation). Married in 1217 Isabel Marshal. Maud (Matilda) de Clare (ca. 1184–1213), married in 1206, Sir William de Braose, son of William de Braose and Maud de St. Valery. [S746] Wikipedia, online http://Wikipedia.com, https://en.wikipedia.org/wiki/Richard_de_Clare,_3rd_Earl_of_Hertford. [S746] Wikipedia, online http://Wikipedia.com, https://en.wikipedia.org/wiki/Roger_de_Clare,_2nd_Earl_of_Hertford. [S746] Wikipedia, online http://Wikipedia.com, https://en.wikipedia.org/wiki/Gilbert_de_Clare,_5th_Earl_of_Gloucester. Biography*: John de Lacy (c.?1192 – 22 July 1240) was the 2nd Earl of Lincoln, of the fourth creation. He was the eldest son and heir of Roger de Lacy and his wife, Maud or Matilda de Clere (not of the de Clare family). He was hereditary constable of Chester and, in the 15th year of King John, undertook the payment of 7,000 marks to the crown, in the space of four years, for livery of the lands of his inheritance, and to be discharged of all his father's debts due to the exchequer, further obligating himself by oath, that in case he should ever swerve from his allegiance, and adhere to the king's enemies, all of his possessions should devolve upon the crown, promising also, that he would not marry without the king's license. By this agreement it was arranged that the king should retain the castles of Pontefract and Dunnington, still in his own hands; and that he, the said John, should allow 40 pounds per year, for the custody of those fortresses. But the next year he had Dunnington restored to him, upon hostages. John de Lacy, 7th Baron of Halton Castle, 5th Lord of Bowland and hereditary constable of Chester, was one of the earliest who took up arms at the time of the Magna Charta, and was appointed to see that the new statutes were properly carried into effect and observed in the counties of York and Nottingham. He was one of twenty-five barons charged with overseeing the observance of Magna Carta in 1215. He was excommunicated by the Pope. Upon the accession of King Henry III, he joined a party of noblemen and made a pilgrimage to the Holy Land, and did good service at the siege of Damietta. In 1232 he was made Earl of Lincoln and in 1240, governor of Chester and Beeston Castles. In 1237, his lordship was one of those appointed to prohibit Oto, the pope's prelate, from establishing anything derogatory to the king's crown and dignity, in the council of prelates then assembled; and the same year he was appointed High Sheriff of Cheshire, being likewise constituted Governor of the castle of Chester. He married firstly Alice in 1214 in Pontefract, daughter of Gilbert de Aquila, who gave him one daughter Joan. Alice died in 1216 in Pontefract and, after his marked gallantry at the siege of Damietta. He married secondly in 1221 Margaret de Quincy, only daughter and heiress of Robert de Quincy, son of Saer de Quincy, 1st Earl of Winchester, by Hawyse, 4th sister and co-heir of Ranulph de Mechines, Earl of Chester and Lincoln, which Ranulph, by a formal charter under his seal, granted the Earldom of Lincoln, that is, so much as he could grant thereof, to the said Hawyse, "to the end that she might be countess, and that her heirs might also enjoy the earldom;" which grant was confirmed by the king, and at the especial request of the countess, this John de Lacy, constable of Chester, through his marriage was allowed to succeed de Blondeville and was created by charter, dated Northampton, 23 November 1232, Earl of Lincoln, with remainder to the heirs of his body, by his wife, the above-mentioned Margaret. In the contest which occurred during the same year, between the king and Richard Marshal, 3rd Earl of Pembroke, Earl Marshal, Matthew Paris states that the Earl of Lincoln was brought over to the king's party, with John of Scotland, 7th Earl of Chester, by Peter de Rupibus, Bishop of Winchester, for a bribe of 1,000 marks. By this marriage he had one son, Edmund de Lacy, Baron of Pontefract, and two daughters, of one, Maud, married Richard de Clare, 6th Earl of Gloucester. [S746] Wikipedia, online http://Wikipedia.com, https://en.wikipedia.org/wiki/John_de_Lacy,_2nd_Earl_of_Lincoln. Biography*: Guigues the Old, count of Albon, called Guigues III (between 1050 and 1060–1133) was a Count of Albon from 1079, when the County of Vienne, then in the possession of the Archdiocese of Vienne, was divided between him and Humbert I of Savoy, who received Maurienne. He was the son of Guigues II d'Albon and Petronel of Turin. His ancestors were lords of the castle of Albon and counts (comites) in the Grésivaudan and Briançonnais. Guigues's reign was marked by continual strife with Hugh of Châteauneuf, Bishop of Grenoble, over the suzerainty of certain church lands in the Grésivaudan. Hugh accused the count of usurping the lands with the help of the Bishop Mallem and invented fantastic stories to back up his claim to the disputed estates. Finally an accord was signed between Guigues and the bishop in 1099. Guigues returned the ecclesiastic land, while Hugh recognised the authority of the count in the vicinity of Grenoble. In 1095, Guigues contracted an exemplary marriage with the high-born Matilda, long thought to be the daughter of Edgar the Aetheling, but now thought more likely to have been a daughter of Roger I of Sicily, the Great Count, and his third wife, Adelaide del Vasto. Patrick Deret, however, alleges, on the basis of possible birth dates, that her mother must have been Roger's second wife, Eremburga of Mortain. Biography*: William I (1020 – 12 November 1087), called the Great (le Grand or Tête Hardie, "the Stubborn"), was Count of Burgundy from 1057 to 1087 and Mâcon from 1078 to 1087. He was a son of Renaud I and Alice of Normandy, daughter of Richard II, Duke of Normandy. William was the father of several notable children, including Pope Callixtus II. William married a woman named Stephanie before 1087. [S746] Wikipedia, online http://Wikipedia.com, https://en.wikipedia.org/wiki/William_I,_Count_of_Burgundy. Biography*: Wladyslaw II the Exile (Polish: Wladyslaw II Wygnaniec) (1105 – 30 May 1159) was a High Duke of Poland and Duke of Silesia from 1138 until his expulsion in 1146. 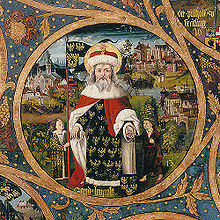 He is the progenitor of the Silesian Piasts. He was the eldest son of Duke Boleslaw III Wrymouth, sole ruler of Poland since 1107, by his first wife Zbyslava, a daughter of Sviatopolk II of Kiev. As the firstborn son, W?adys?aw's father decided to involve him actively in the government of the country. Some historians believe that Boles?aw III gave W?adys?aw the district of Silesia before his own death, in order to create an hereditary fief for his eldest descendants. Around 1125 W?adys?aw married Agnes of Babenberg, daughter of Margrave Leopold III of Austria; this union gave him a close connection with the Holy Roman Empire and the Kingdom of Germany: Agnes by her mother was a granddaughter of Emperor Henry IV and a half-sister of the Franconian duke Conrad III of Hohenstaufen, the later King of Germany. Thanks to Wladyslaw, Silesia was saved during the wars of 1133–1135 with Bohemia: he stopped the destruction of the major areas of his district after the Bohemian forces crossed the Oder River. In 1137, during the whitsun meeting with Duke Sob?slav I of Bohemia at Niemcza (other sources mention Klodzko), in which several disputed matters were decided, Wladyslaw stood as godfather in the baptism of the youngest son of Sob?slav, the future Duke Wenceslaus II. Duke Boleslaw III died on 28 October 1138. In his will, he sought to maintain the unity of the Polish lands as well as to prevent inheritance conflicts among his sons. He therefore determined a kind of mitigated primogeniture principle: As the oldest son, the supreme authority in the country was assigned to Wladyslaw with the title of a High Duke (Princeps). In addition to Silesia, he received the central Seniorate Province, stretching from Lesser Poland at Kraków to eastern Greater Poland and western Kuyavia, as well as the authority over the Pomerelian lands at Gdalsk on the Baltic Sea. His younger half-brothers Boleslaw IV the Curly and Mieszko III received the eastern Duchy of Masovia (composed of Masovia with eastern Kuyavia) and the western Duchy of Greater Poland (the remaining parts of Greater Poland with Lubusz Land) respectively, each as hereditary fiefs. Upon the death of Boleslaw's widow Salomea of Berg, Wladyslaw would also receive her oprawa wdowia (a kind of usufruct pension) at Lczyca, which had to revert to the Seniorate. On the other hand, he was obliged to provide his youngest half-brother Henry with the lands of Sandomierz when he would come of age (though only for life). The district however was not separated from the Seniorate until 1146. The youngest of his half-brothers, the later High Duke Casimir II the Just was not assigned any province; it is speculated that he was born after Boles?aw III's death. At the time of the death of his father, Wladyslaw was already an adult, with many years of marriage and at least one surviving son, Boleslaw I the Tall, born in 1127 (the date of birth of the second son, Mieszko IV Tanglefoot, is still debatable and varies between 1130 and 1146). Following the examples of his predecessors Boles?aw I Chrobry in 992, Mieszko II Lambert in 1032, and his own father in 1106, the High Duke almost immediately tried to restore the unity of the country. Given his life experience and military leadership, it was generally expected that in the end, he would be successful. The disputes of Wladyslaw with his stepmother Salomea and his half-brothers began openly in 1141, when the Dowager Duchess, without the knowledge and consent of the High Duke, commenced to divide her Lczyca province between her sons. Also, she tried to resolve the marriage of her youngest daughter Agnieszka and thus to find a suitable ally for her sons. The most appropriate candidate for a son-in-law had to be one of the sons of the Grand Prince Vsevolod II of Kiev. After hearing the news about the events in ? ?czyca, W?adys?aw decided to make a quick response, as a result of which the Grand Prince of Kiev not only broke all his pacts with the Junior Dukes, but also arranged the betrothal of his daughter Zvenislava to Wladyslaw's eldest son Boleslaw. The wedding took place one year later, in 1142. His ties with the Kievan Rus' benefited him during 1142-1143, when Wladyslaw decided to fight against the districts of his brothers. Wladyslaw's victory was beyond dispute, being backed by his alliances with the Rus', Bohemia and the Holy Roman Empire. During Wladyslaw's reign, the Silesian voivode (count palatine) Piotr Wlostowic had the greatest and most decisive impact. A firm follower of Duke Boleslaw III, he had soon acquired enormous political significance in the country, covering the most important court offices. In his prerogative as voivode he had the right to appoint officials in local authorities across Poland, including in the areas of the Junior Dukes, which made him the person from whose decisions was determined the fate of the state. In view of the conflict between her sons and Wladyslaw looming ahead, Boleslaw's wife Salomea of Berg intrigued against him, whereafter W?ostowic had to resign and was replaced by one of her minions. When Wladyslaw succeeded his father, he reinstated the voivode, however the increased power of Wlostowic fostered deep negative relations, especially with his wife Agnes of Babenberg, who - not without reason - considered him a traitor. On 27 July 1144 Salomea of Berg, Duke Boleslaw's widow and W?ostowic's bitter enemy, died. As in accordance with the Duke's will, her province of Lczyca had to revert to the Senoriate Province of Wladyslaw, the voivode, in agreement with the Junior Dukes, planned a coup d'état in order to take the contested district, perhaps as emolument for the younger Henry. Again in this case, Wladyslaw appealed for aid to his Kievan allies. Without waiting the arrival of food he sent his troops against the forces of Boleslaw IV the Curly and Mieszko III; unexpectedly, Wladyslaw suffered a defeat. It wasn't until the arrival of the Kievans that the fate of the battle and the war turned to Wladyslaw's side. Immediately, a favourable peace treaty was made, which permitted the High Duke to take full control over Lczyca; however, he had to give to the Kievan cohorts, in exchange for their aid, the Polish castle at Wizna. In the meanwhile, the tensions between Wladyslaw and Piotr Wlostowic worsened. The position of the Count Palatine in the civil war was clearly against the High Duke. This attitude clearly did not correspond with Wladyslaw's concept of autocracy, and after this episode he thought about the total removal of his brothers from their lands. By 1145 however, it seemed that a reconciliation between the High Duke and Wlostowic was possible, as evidenced by the invitation to Wladyslaw by the voivode on the occasion of Wlostowic's son wedding. At the beginning of the following year the High Duke, however, decided to bet everything on one gamble: eliminate Wlostowic from his life for good. He ordered one of his knights, Dobek, to capture him. Dobek arrived at Wlostowic's court at Olbin (in present-day Wroclaw), and during the night captured the voivode with his men. High Duchess Agnes demanded Wlostowic's death, but Wladyslaw decided instead to make an example out of him: he was blinded, muted and sentenced to exile. Wlostowic was respected and had many friends, and his fate caused many nobles to switch their allegiance to the Junior Dukes. Furthermore, the blinded Wlostowic fled to the Kievan Rus', which had so far supported W?adys?aw, and convinced them to break their alliance. At the beginning of 1146 Wladyslaw decided to made the final attack on his rivaling half-brothers. Initially, it seemed that victory of the High Duke was only a matter of time, since he managed to take Masovia without obstacles and forced Duke Boles?aw IV the Curly to withdraw to the defense of his brother Mieszko III at Pozna? in Greater Poland. There, unexpectedly, began Wladyslaw's disaster. The reason for this was the insecurity of his other districts, where mighty rebellions erupted against Wladyslaw's dictatorial politics. The rebels quickly grew in power thanks to the support of Archbishop Jakub ze Lnina of Gniezno, who excommunicated the High Duke – as a punishment for the fate of the voivode Wlostowic – resulting in an additional series of rebellions. The defeat at the end was thanks not only to the combined forces of Duke Boleslaw IV at Poznan with the troops of the other Junior Dukes, but also by Wladyslaw's own subjects, which was a total surprise to him. The High Duke was forced to flee abroad; shortly afterwards his wife Agnes and children joined him, after their unsuccessful attempts to defend Kraków. The Junior Dukes had a complete success, and Wladyslaw was now under the mercy of his neighbours. Initially, he and his family stayed in the court of his namesake and brother-in-law Duke Vladislaus II of Bohemia at Prague Castle. The title of a High Duke was assumed by Bo?eslaw IV. Wladyslaw did never return to Poland. Soon after his arrival in Bohemia, his brother-in-law King Conrad III of Germany offered him his hospitality. Wladyslaw shortly after moved to Germany and paid tribute to King Conrad and asked for assistance in regaining the throne. As King Conrad also had been able to reinstate Vladislaus of Bohemia shortly before, it initially appeared that Wladyslaw would regain power over Poland very soon. The expedition against the Junior Dukes was launched in 1146, but due to flooding of the Oder river and the pressure on the German king by the margraves Albert the Bear and Conrad of Meissen, who showed no interest in an armed conflict at the German eastern border, the campaign finally failed. Wladyslaw of course did not lose hope of changing his fate, but for now he had to accept the postponement of his return, particularly when Conrad III started the Second Crusade with King Louis VII of France to the Holy Land the next year. During this time, the former High Duke administrated the Kaiserpfalz at Altenburg and its dependencies in the Imperial Pleissnerland. Without waiting for German aid, Wladyslaw and his wife Agnes went to the Roman Curia and asked Pope Eugene III for help, but this attempt was also unsuccessful. In 1152 King Conrad III died and was succeeded by his nephew Frederick Barbarossa. With this, the hopes of Wladyslaw of returning to Poland were reborn. Following the inducements of Wladyslaw and Frederick's aunt Agnes of Babenberg, the Holy Roman Emperor launched a new expedition to Greater Poland in 1157. The campaign was a success, but unexpectedly Frederick Barbarossa did not restore Wladyslaw to the Polish throne, after Boleslaw IV apprehended at Krzyszkowo had to declare himself a vassal to the Emperor and was compelled to pay tribute to him. In compensation, the Emperor forced Boleslaw IV to promise the restitution of Silesia to Wladyslaw's sons Boleslaw the Tall and Mieszko IV Tanglefoot. At this time, it appears, Wladyslaw knew that his battle for supremacy in Poland was finally lost. He remained in exile at Altenburg, where he died two years later. It was not until 1163 that Boles?aw IV finally granted the Silesian province to Wladyslaw's sons. Apart from the question of an actual enfeoffment of W?adys?aw's sons by the Emperor, a disruption between them and their Piast cousins had occurred. In the following centuries, Silesia was divided into as many as 17 separate duchies among their descendants and successors, who from the early 14th century onwards gradually became vassals of the Imperial Kingdom of Bohemia. By the 1335 Treaty of Trentschin the Polish king Casimir III the Great renounced all claims to the Silesian lands, which remained under the rule of the Silesian Piasts until the male line of the dynasty finally became extinct with the death of Duke George William of Legnica in 1675. Boleslaw I the Tall (b. 1127 – d. 8 December 1201). Mieszko I Tanglefoot (b. ca. 1130 – 16 May 1211). Richeza (b. 1140 – d. 16 June 1185), married firstly in 1152 to Alfonso VII, King of Galicia, Castile and León, secondly in 1162 to Ramon Berenguer II, Count of Provence and thirdly by 1167 to Count Albert III of Everstein. Konrad Spindleshanks (b. 1146/57 – d. 17 January 1190). Biography*: Ælfthryth (c 945 – 1000 or 1001, also Alfrida, Elfrida or Elfthryth) was the second or third wife of King Edgar of England. Ælfthryth was the first king's wife known to have been crowned and anointed as Queen of the Kingdom of England. Mother of King Æthelred the Unready, she was a powerful political figure. She was linked to the murder of her stepson King Edward the Martyr and appeared as a stereotypical bad queen and evil stepmother in many medieval histories. Ælfthryth was the daughter of Ealdorman Ordgar. Her mother was a member of the royal family of Wessex. The family's power lay in the west of Wessex. Ordgar was buried in Exeter and his son Ordwulf founded, or refounded, Tavistock Abbey. Ælfthryth was first married to Æthelwald, son of Æthelstan Half-King as recorded by Byrhtferth of Ramsey in his Life of Saint Oswald of Worcester. Later accounts, such as that preserved by William of Malmesbury, add vivid detail of unknown reliability. According to William, the beauty of Ordgar's daughter Ælfthryth was reported to King Edgar. Edgar, looking for a Queen, sent Æthewald to see Ælfthryth, ordering him "to offer her marriage [to Edgar] if her beauty were really equal to report." When she turned out to be just as beautiful as was said, Æthelwald married her himself and reported back to Edgar that she was quite unsuitable. Edgar was eventually told of this, and decided to repay Æthelwald's betrayal in like manner. He said that he would visit the poor woman, which alarmed Æthelwald. He asked Ælfthryth to make herself as unattractive as possible for the king's visit, but she did the opposite. Edgar, quite besotted with her, killed Æthelwald during a hunt. The historical record does not record the year of Æthelwald's death, let alone its manner. No children of Æthelwald and Ælfthryth are known. Edgar had two children before he married Ælfthryth, both of uncertain legitimacy. Edward was probably the son of Æthelflæd, and Eadgifu, later known as Saint Edith of Wilton, was the daughter of Wulfthryth. Sound political reasons encouraged the match between Edgar, whose power base was centred in Mercia, and Ælfthryth, whose family were powerful in Wessex. In addition to this, and her link with the family of Æthelstan Half-King, Ælfthryth also appears to have been connected to the family of Ælfhere, Ealdorman of Mercia. Edgar married Ælfthryth in either 964 or 965. In 966 Ælfthryth gave birth to a son who was named Edmund. In King Edgar's charter regranting privileges to New Minster, Winchester that same year, the infant Edmund is called "clito legitimus" (legitimate ætheling), and appears before Edward in the list of witnesses. Edmund died young, circa 970, but in 968 Ælfthryth had given birth to a second son who was called Æthelred. King Edgar organised a second coronation on 11 May 973 at Bath, perhaps to bolster his claim to be ruler of all of Britain. Here Ælfthryth was also crowned and anointed, granting her a status higher than any recent queen. The only model of a queen's coronation was that of Judith of Flanders, but this had taken place outside of England. In the new rite, the emphasis lay on her role as protector of religion and the nunneries in the realm. She took a close interest in the well-being of several abbeys, and as overseer of Barking Abbey she deposed and later reinstated the abbess. Ælfthryth played a large role as forespeca, or advocate, in at least seven legal cases. As such, she formed a key part of the Anglo-Saxon legal system as a mediator between the individual and the crown, which was increasingly viewing its role in the courts as a symbol of its authority as protector of its subjects. Ælfthryth's actions as forespeca were largely for the benefit of female litigants, and her role as a mediator shows the possibilities for women to have legal and political power in late Anglo-Saxon England. Edgar died in 975 leaving two young sons, Edward and Æthelred. Edward was almost an adult, and his successful claim for the throne was supported by many key figures including Archbishops Dunstan and Oswald and the brother of Ælfthryth's first husband, Æthelwine, Ealdorman of East Anglia. Supporting the unsuccessful claim of Æthelred were his mother, the Queen dowager, Bishop Æthelwold of Winchester, and Ælfhere, Ealdorman of Mercia. On 18 March 978, while visiting Ælfthryth at Corfe Castle, King Edward was killed by servants of the Queen, leaving the way clear for Æthelred to be installed as king. Edward was soon considered a martyr, and later medieval accounts blamed Ælfthryth for his murder. According to the Anglo-Saxon Chronicle, King Edward was murdered at Corfe Castle in 978. As the king developed into a cult figure, a body of literature grew up around his murder, at first implying and then accusing his step-mother, Queen Aelfthryth, of being responsible. The 12th century monastic chronicle the Liber Eliensis went so far as to accuse her of being a witch, claiming that she had murdered not only the king, but also Abbot Brihtnoth of Ely. Due to Æthelred's youth, Ælfthryth served as regent for her son until his coming of age in 984. By then her earlier allies Æthelwold and Ælfhere had died, and Æthelred rebelled against his old advisers, preferring a group of younger nobility. She disappears from the list of charter witnesses from around 983 to 993, when she reappears in a lower position. She remained an important figure, being responsible for the care of Æthelred's children by his first wife, Ælfgifu. Æthelred's eldest son, Æthelstan Ætheling, prayed for the soul of the grandmother "who brought me up" in his will in 1014. [S746] Wikipedia, online http://Wikipedia.com, https://en.wikipedia.org/wiki/%C3%86lfthryth,_wife_of_Edgar. Biography*: Saint Leopold III (German: Luitpold, 1073 – 15 November 1136), known as Leopold the Good, was the Margrave of Austria from 1095 to his death in 1136. He was a member of the House of Babenberg. He was canonized on 6 January 1485 and became the patron saint of Austria, Lower Austria, Upper Austria, and Vienna. His feast day is 15 November. Leopold was born at Babenberg castle in Gars am Kamp, the son of Margrave Leopold II and Ida of Formbach-Ratelnberg. The Babenbergs cames to Austria from Bavaria where the family had risen to prominence in the 10th Century. In 1096 Leopold succeeded his father as margrave of Austria at the age of 23. He married twice. His first wife may have been one of the von Perg family, who died in 1105. The following year he married Agnes, the widowed sister of Emperor Henry V whom he had supported against her father Henry IV. This connection to the Salians raised the importance of the House of Babenberg, to which important royal rights over the margravate of Austria were granted. Also, Agnes had influential connections through her previous marriage to Frederick of Hohenstaufen, one of her sons being Conrad III of Germany. Agnes, m. W?adys?aw II of Poland. Conrad, Bishop of Passau and Archbshop of Salzburg. [S746] Wikipedia, online http://Wikipedia.com, https://en.wikipedia.org/wiki/Leopold_III,_Margrave_of_Austria. [S746] Wikipedia, online http://Wikipedia.com, https://en.wikipedia.org/wiki/Leopold_II,_Margrave_of_Austria.